Every business starts with a small venture and grows gradually along with power in the business. And with great power comes great responsibilities. As the business grows, demands from the customer increases, retailers tend to seek temporary systems and management for each hurdle that comes along the way, but down the line, they start to act more like a burden than a useful resource. Retailing software or retail shop software as an integrated platform as a total management system, designed to handle all the aspects of your business is the best solution so far. On daily basis, you have a deal with sales, receipts, transactions, returns, supply chain management, stocks, inventories, customer management system and many other things, and imagining a system which can handle everything at one place is itself a miracle. No more multi-headaches : You get to have more time to attend to your business rather than working yourself on management issues and responsibilities. It directly kills the IT maintenance issues and integration and deployability charges. Pait’s customized retail shop software’s can manage everything you need. Everything on one thing :You can see real-time values of assets, sales, stocks and many other details from anywhere on a single platform in billing software for a retail shop. It helps you keep the track of what is getting purchased from your retail shop. Paved and Polished streamlined transaction : Immediate access to prices, customer profiles and discounts creates a way to have faster checkouts and proper history of transaction made at by the customer to the cashier, decreasing waiting time of the customer. 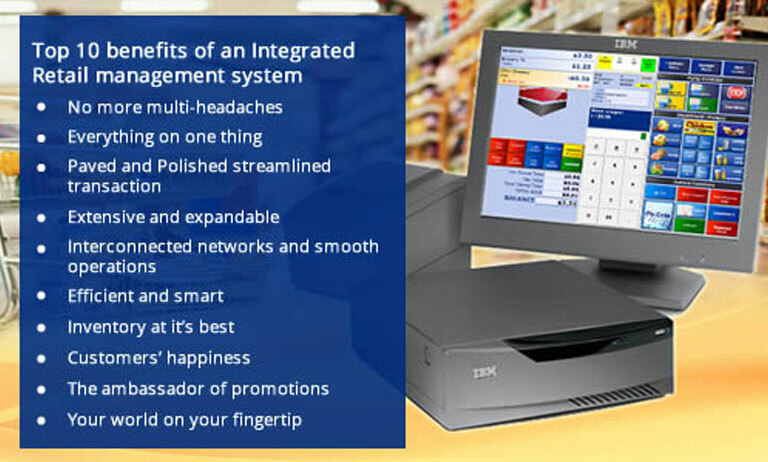 Extensive and expandable : Customized retail POS software is the true nature for business platforms as a software. You can easily deploy new systems to new locations anywhere inside your shop or shops to be specific. Along with this, you can add any new application to your system as per your need. Interconnected networks and smooth operations : No your all departments can have a direct view of what's the status and can become more cooperative having a harmonized flow of events in your business. Efficient and smart :Business is now crucially dependent on data. An integrated platform not only collects accurate data but also manages and filters it to provide anything you need, like reports of sales to inventory, while showing effects of each department on other. Inventory at it's best : The most important thing a retail shop is based and valued upon is its inventory. An IRMS platform will provide better details about your stock along with suggesting and notifying what to be ordered according to the sales being made. Customers' happiness : Faster, adaptability to advanced Payment and streamlined processing of billing will satisfy the one who is the fate of your business, your customer and his experience. The ambassador of promotions : Discounts and gifts specific to the customer based on their profile history, new schemes for festivities, promotions etc can be planned and predicted by the software system itself, based on a variety of reports, analyzed and displayed on a user interface screen with advanced features. Your world on your fingertip : If you are a multi-channel retailer, you can have your website, e-commerce platform, orders etc on a single application along with providing you with an important asset, data of customers, which can be used for analysis of pros and cons of deployment of changes in your retailing business. You have to see what's best for your business and choose wisely. Customize, adapt and move forward is what a business owner should and is seeking. Advancements in business come with advancements in needs, fulfilled by solutions experts like us, at PAIT BIZ Pvt Ltd. We pioneer for hardware AMC in Pune, POS Software in Pune, India, and our retail billing software is one of the best in the industry. We help you harvest the most out of what you have and help you to have more with our billing software for a retail shop.